The foundation of my work is a solid, custom tuning. rebuilding, remanufacturing, and restorative conservation service. As an expert on vintage pianos I can be relied on for the best advice in a consultation. Cabinet restoration and refinishing resources are also provided. Read testimonials about my work. 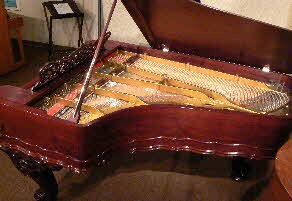 This 1880 Weber grand received complete restoration respectful of the original design. The original soundboard was duplicated for an authentic original sound and restoration. The action received t careful balancing of Stanwood PTD, to achieve the ultimate performance of touch and tone, while retaining the distinctive period color and character.